Children walk to school Monday in Afghanistan, where girls are often violently targeted by people who oppose their education. 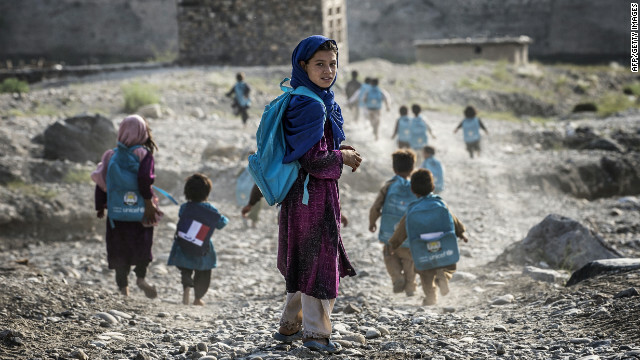 (CNN) - For many girls in Afghanistan, the simple act of walking to school can be a life-threatening journey. "You close the door behind you, and you enter a war zone," said Nushin Arbabzadah, an American-based author and scholar who was raised in Afghanistan. There were at least 185 documented attacks on schools and hospitals in Afghanistan last year, according to the United Nations, and the majority of those attacks were attributed to armed groups opposed to educating females. But "the walk from home to school is - and has always been - the most dangerous part," Arbabzadah said. "You are told to stay covered, keep your head down and walk quickly ... and stare at your toes." The life of a schoolgirl in Afghanistan is a far cry from reading, writing and arithmetic. Some girls have been maimed by acid attacks. Others have had their drinking water poisoned or been targeted by bombers who think females should be forbidden from school - as they were during the Taliban's rule. "It is unfathomable that anyone would want to hurt them. But that is the reality," said Beth Murphy, a documentary filmmaker who recently traveled to Afghanistan to work on a feature film about girls' education. Amid the violence, however, there is promise: In a country where just 6% of women 25 and older have received any formal education, millions of girls are at long last enrolling in school. Aww that's so sad war needs to stop! yeahhhh yaaaaaaa ....for the school for helping children plus teens loose weight. Send them to America! We are so far in debt that it doesn't matter at this point. These attacks are threatening these girls, but the education must be worth that risk.